This is the common pricing model by VMware. The price is based on CPU sockets. As of today there is an unlimited virtual memory entitlement. (In 2011/2012 with vSphere 5 the memory entitlement was limited to 96GB per CPU socket within Enterprise Plus.) That implies that the cost factor is only the CPU Power. You do not need to consider virtual or physical memory when buying perpetual licenses. This makes the licensing really easy. Just count the CPU sockets, buy one additional vCenter license and you are done. Perpetual editions does not include a vCenter Server. Additionally you always have to pay Subscription and Support (SnS) for at least one year. Since vSphere 5.1 there is a new pricing model available, the vCloud Suite which also includes vSphere Enterprise Plus, vCloud Director and VMware vCloud Networking and Security Standard. I will take this into consideration because vCloud director is also included in VSPP. The VMware Service Provider Program (VSPP) is suitable for partners who offer hosted IT services to 3rd parties. This is a non-pertual, pay-per-use model where a service provider licenses VMware products through a points based model where each product costs a specific number of points per month. The retail price for a single point is $1,00. The more points a service provider consumes, the less a single point costs. The package i want to compare against perpetual licensing is the VMware vCloud Service Provider Bundle - Premier Edition which costs 7 points per month and is charged per 1GB reserved memory. This package includes vSphere Enterprise Plus, vCenter Server Standard, vCloud Director and VMware vCloud Networking and Security Advanced. The lower limit on reservation percentage is 50%, so even when you do not work with memory reservations you have to pay 50% of the virtual machines memory. There is also a pricing cap of 24GB per virtual machine. You will never be charged for more than 24GB reserved memory per vm. Reserved memory is a pure technical function. It guarantees a specific amount of physical memory to the virtual machine. Per default no reservations are configured. You can reserve all guest memory by selecting "Reserve all guest memory (All locked)" or reserve a specific amount of Megabytes. Because of that 50% and 24GB VSPP rule, licensing should be considered during resource planning. There is no doubt that VSPP has a lot of advantages. You can size and buy a large cluster and grow while paying only the resources you actually use. You are much more flexible to run a cluster for a few month. Adding hosts to an existing cluster does not require additional licensing overhead. You do not have to track licenses, you just report what you use. HA failover resources are free. You do not need to consider vCenter Server licenses, because they are included. But are there any drawbacks except that is only available for service providers and not for internal use? Are there any circumstances that make perpetual licensing more attractive? Let's do the math! 3 ESXi Hosts with 2 Sockets, 64GB of RAM with one failover node. Conclusion: VSPP licensing is really attractive for small entry clusters. Even with memory overcommitment or 100% memory reservation, it is much cheaper. Now i want to make both models comparable. How to compare a static cpu socket based license with the dynamic per vRAM licensing? The answer seems to be simple: How much memory is equivalent to one CPU socket? I am going to compare 2 and 4 CPU socket systems against VSPP memory cost where VSPP has a lower limit (no memory reservation) and an upper limit (full memory reservation). To make this example more real-world, the cluster size is set to 10 with one failover node. Interesting reading and nice to see a clear description about the VSPP licensing model. However, could you explain under the VSPP licensing model whether you are still required to license the host itself, or is this purely covered all by the VSPP? You do not have to license the ESXi host or the vCenter. You only pay for the virtual machines. You can buy 5 Hosts and build a cluster including vCenter and do not have to pay any VMware licenses. Only after deploying your first virtual machine to that cluster, you have to pay the virtual machines reserved memory. That is fantastic, not only does this page explain in a much easier fashion than anything else I've seen but you've also managed to answer the question which no one has been able to answer simply, without getting into the complete wrangles of licensing! thanks for the comment and you are totally right. I did not mention that 360, 1,800, 3,600,[...] packaging in depth. I resumed that to "The more points you consume, the less a single point costs.". You have to pay the minimum amount of 360 points to get into the VSPP, even if you do not consume them. Running ESXi and vCenter actually costs nothing (=0 Points) if they have no virtual machines running. It's open to interpretation whether you pay for "being with VSPP" or "paying for (your first) ESXi-Cluster running without VMs". I am trying to update my comment and post to make it more clear. 1- Can you resell (become a service provider) after buying the Perpetual or it's only for internal use? 2- If you commit for the 360 minimum on the VSPP - does the the unused points rollover to next month in case you have months that you have not use any resources? 3- Will you be able to advertise your service as a partner and add logo as sevice provider if you have VSPP , Perpetual or both - Does it even matter? 2. No. I've not heard of points rolling over to the next months. The smallest package is 360 Points which is not much. Perpetual licenses are much more expensive. 3. With VSPP you are eligible to use Service Provider Partner logos. You are also listed at the Partner Locator. Great article comparing the cost of the different licensing models. I am not the VMware police, but one thing to note here is the EULA. Service Providers who offer hosted services to 3rd parties in a multi-tenant environment are required to use the VSPP licensing model. The only exception are Service Providers who offer Software as a Service (using their own internally developed software). In which case, MSPs have the option to chose either the perpetual licensing model OR VSPP. Great article and thanks for the information. One question I have though is your first calculation of the 3 node cluster...where did you come up with the number of 392/month? Is the 64GB RAM the total of all 3 hosts combined or 64GB per host which would be 192GB possibly available to VM's)? The points/usage is based off average daily vRAM consumption. So for example, you have a scenario where certain VMs are only powered on for certain times of the day, you can pull more granular reporting from the Usage Meter - whereas it calculates number of gigabyte hours. Then you would divide by total number of hours the VM was powered in within that month (for example, 720 hours = 1 month) The program Guide lists a couple examples of this. 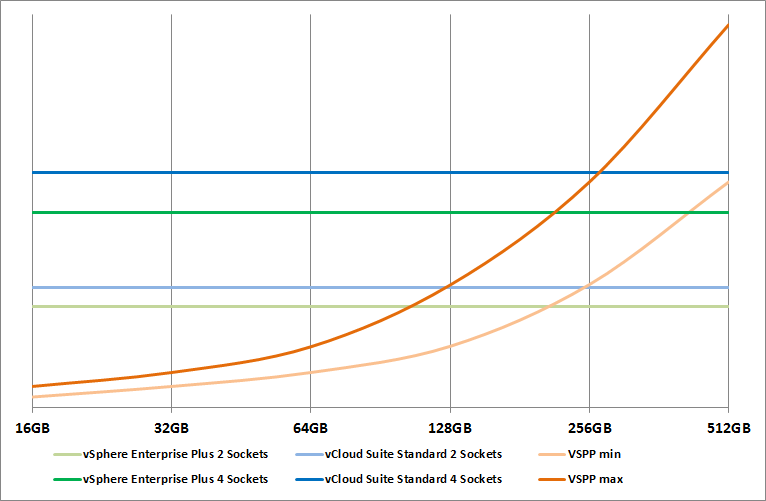 In terms of max price, you would just take the number of virtual machines x 24 gb x 5 to get point totals. Actually, this is a really poor analysis. "Making it comparable" is flawed. Perpetual licenses can be re-deployed onto better servers, so the underlying capabilities are not static, they are dynamic over time (basically improving at high rates -- Moore's Law). The VSSP model is far more static (per memory, where performance grows more slowly the processors). VMware knows this. That is why they tried the memory pricing model in the enterprise market, only to receive pushback and had to largely pull it back. Providers succumbed to this poor pricing model simply because they cannot steer end demand.